This is my first go at this so hopefully it passes inspection...? I designed and made the first of these torches in late 2006 (shocked myself with that date!) and they have been posted for some time on various engineering forums and on youtube since Dec 2009. This means that all I'm about to do is put up all the build notes that accompany the 4 videos and then add some of the hundreds of still photo's I have in my library. I know this is weak when it comes to instructable effort since it's already out in the world, but I'm hoping that the original 20+ hours in the video editing alone goes to exonerate me in some way? I'm thinking that some may find these a fun little project. The basic version of the torch is mostly made using a metal turning lathe, Some of the more complex versions involve a milling machine as well. I do try to answer all serious questions and will supply any extra pictures or information if required. Step 1: The Main Body. All measurements are metric. But with a little jiggery pokery you can find the imperial equivalent for the threads I'm sure. Text to accompany Video 1. 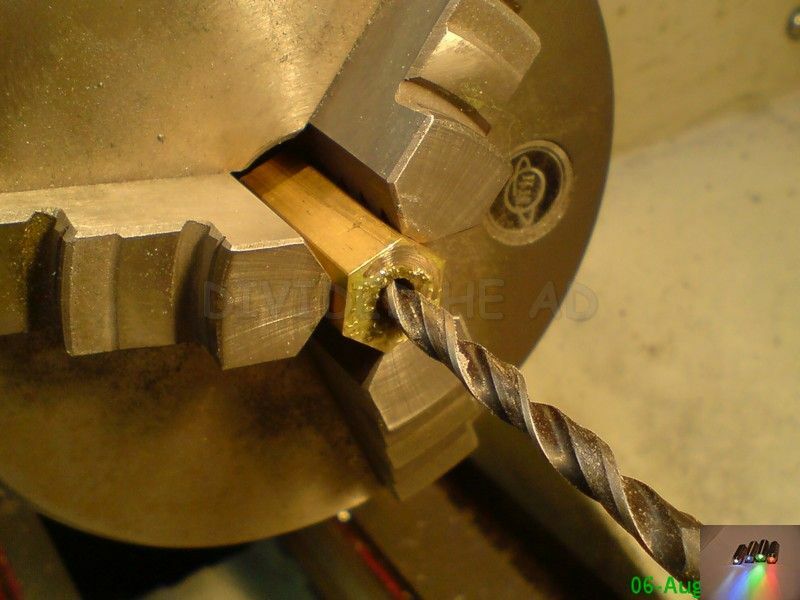 1/ Cut length of 13mm (1/2") hex or 14mm (9 1/6") round brass bar to be finished to 25mm(~1") length. Round bar at 13mm (1/2") will show thread cut on outside and can be hard to get rid of. That's if it doesn't tear through the side?! 14mm bar allows a quick lateral turning with the cap blank screwed tight so it mates perfectly. (before the cap is cut and shaped!) Hex shows thread slightly but a light draw filing or lapping sorts this. 2/ Face off both ends. 6/ Remove the main body and place to one side. take another length of bar at least long enough to get a parting tool into once it has been cross drilled. .see video1. Turn down to 12mm dia and at least 9mm length. 7/ Cut M12x1.5 thread onto remaining turned section. If your not too fussed Like in the video, then leave it! The torch when off will be where you set it. lined up if you want it that way, and when it's on it'll be where ever it is. Up to you what you want it to finish like. 10/ Cut a length of thin plastic (packaging like you get paint brushes/batteries etc in is good for this, thin but stiff when cut into a strip. Thickness of plastic must be assessed as slight thickness variations could prevent the batteries from being easily inserted and removed! I pull the plastic hard over a thin round bar, causing it to curve and hold that shape. Trim the plastic to length and depth. The depth of plastic shown is in the C-o-C. It is the height of the two cells stacked. It has to prevent the outer body of the battery/cells from touching the inner of the torch body. Insert the plastic when ready, check for overlap or not enough coverage. Trim it in small slices till you get it just touching once fitted. Else you could use a meter or view the pictures I will add to this at the end. 14/ Insert the completed LED assembly into the main body of the torch and push the led home. This may need a bit of a shove? Use something blunt and narrow enough to go inside the main body. Try not to damage the LED or it's legs! 15/ Insert the insulator strip. 17/ Screw the unfinished cap into position. The LED will illuminate before the cap is all the way home. Check with a vernier or similar, the gap left between the cap and body sections. Step 3: The Tail Cap. 18/ Re-chuck the tail cap blank and remove all but 0.2mm of the length measured. Turn down the threaded section to allow a 8mm dia and 1-2mm deep stub to be formed. 19/ At his point either, remove the work from the lathe or attempt the screw the body with batteries on sideways.... and fit it as per 16 and 17, remove just enough for the light to turn on as the cap and body edges meet. Remove with VERY fine cuts (even a file or emery tape) the amount needed to get the light to turn on just as the cap and body edges meet. Wide enough to take your O ring and deep enough to allow it to stand a hairs width over the centre stub. 21/ Once satisfied that the O ring is to the correct height. Glue it into position. 23/ Part off the cap, (or hack saw) allowing for the correct length to be achieved when making the eye on the cap (I allow 4mm over the top of the cross drilled hole). Step 4: The Finishing Touches. 25/ Turn the torch around and turn your desired concave dish design (being careful not to hit the led!... you could remove all the inners if you wish) You could have the LED protruding? Just be careful not to remove so much material that the LED sticks out and could become scuffed easily, a little scratching effects the light output greatly! I styled some of the simple ones with stepped cuts and rings. But I am sure your own design desires will lead you to a finish of your choice. 27/ Add a split ring, brass coated ones can be purchased very cheaply from a key cutters/hardware store. Takes some doing not to scratch the cap when fitting the split rings though! Once the ring is on it's pretty easy to turn on and off. Might require a smear of petroleum jelly on the O ring? If the grip between the body and main O ring on the cap is weak when turned off ( Off - should be no more than one flat, or on the round torches less than a ¼ turn anti clockwise) and it needs to be tighter to prevent the parts from separating. Then you can cheat with a very narrow strip of black insulation tape under the main O ring. It must be exact length. An overlap will alter the depth considerably. They MUST be slightly stiff to turn, as this stops you losing the body of the torch off the cap as it rattles around on your keys or in your pocket. You can re-make the LED disc/insulator a bit thicker.... This will raise the LED leg (be careful not to damage the legs removing and re-bending them) and raise the batteries... Be sure to check that the insulator sleeve depth, it should be fine. But check it all the same. Well, that's it... Wonder who if anyone will take up my little project? There are many, many types of LED, colours and intensities. From past experience always go for clear narrow focus, 15 0r 30 degrees work well for most applications and as for the mcd rating The higher the brighter is the way it's supposed to go But it's a mine field if you go looking for the best for the buck! You shouldn't pay more than a couple of quid for 50 or so posted from China/Hong Kong via e- blag.. I certainly wouldn't get 'em from the high street retailers here in the UK.... Rip off! Batteries/cells CR927 lithium. I use 2. This gets a lot of "that's 6volts" and "what about your resistor" Oh and don't forget.... "the LEDs won't last" .... Well, I've still got the prototype on my house keys and it's on it's 3rd set of batteries... 6 years and still working. Seems like non of the above is an issue! Rubber O ring - to fit collar of cap 10mm internal 1.2mm dia material (you can alter dimensions of cut to suit your O ring. Nylon or equivalent impact resistant plastic bar @10.3mm min' dia'. I had to replace the written text as apparently it was shockingly hard to read! I'll be making one of these as soon as I get my lathe slighty more geared up.